This week, I photographed one of the tallest peaks in the Cascade Range, a rocky beach along Bellingham Bay, and a harbor. Last Friday, I rode with my sister Margie to take her two granddaughters Kianna and Kalysta back home from Marysville, Wash., to Hood River Oregon. It was a fun-filled trip. Our first big stop was in Gresham, Ore., to see our Aunt Dory and cousin Lou Anne who we have not seen since 1980. That was fun. After that, we headed east on Interstate 84 to Hood River. We stopped briefly at Multnomah Falls. We observed the falls and then the two girls wanted to race to the top. So, with all the energy I could muster, I chased after them. We made it about 2/3rds the way up before we tuckered out and headed back. Mt. 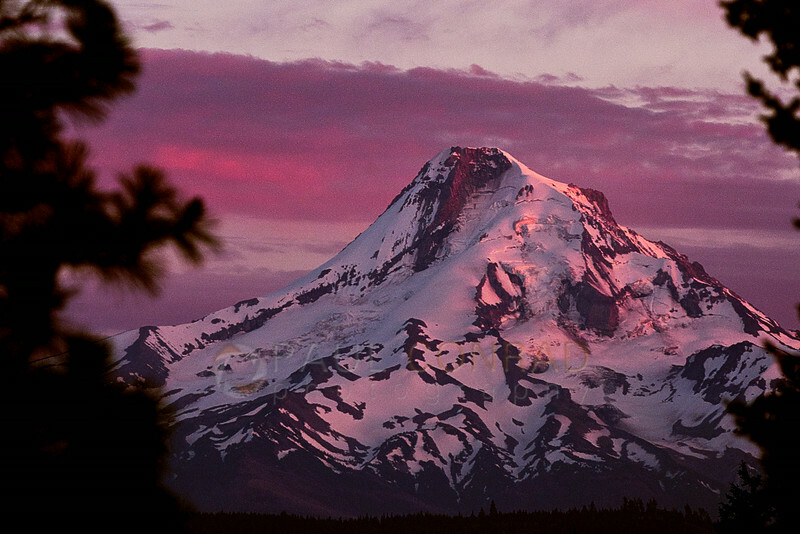 Hood against a backdrop of red clouds as the setting Sun lit the snow on fire. I only had enough time to hop out of the car, fire off a few frames with my cell phone and fire off a few handheld shots with my D300s and 80-200 f/2.8 lens. Then the glow disappeared. My only conundrum was whether I like the vertical or the horizontal better. I like the tightness of the horizontal, but the vertical adds layering and more color in the clouds. Do you like the vertical? Or the Horizontal? Vote below in the poll. 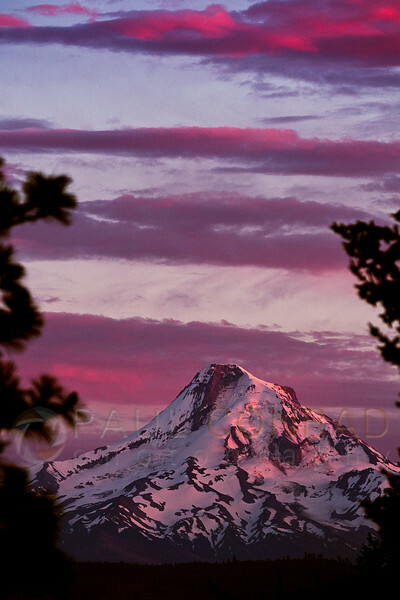 © Paul Conrad/Pablo Conrad Photography – The setting Sun bathes Mt. Hood in alpenglow as seen from Hood River, Ore.
On Tuesday, I went out to shoot sunset over Bellingham Bay from Locust Beach. My purpose was to practice with my B+W ND 3.0 filter. This filter cuts the light down to 1/1000th of its value or 10 stops in loss. Basically, if your exposure without the filter is f/16 at 1/250th, then with the filter it will be approximately f/16 at 4 seconds. But that is an approximate value. Again as I said in a previous post “Photography is Not a Spectator Sport,” practice with your gear until you have a strong understanding of its weaknesses and strengths, and get a great feel for what the result will be. As it was a very high tide due to the “Supermoon,” there was not much space to work on the beach. So after about 1/2 and hour, I left and headed off to find something new. Here’s one frame shot from Locust Beach I shot at f/22 for 8 seconds. 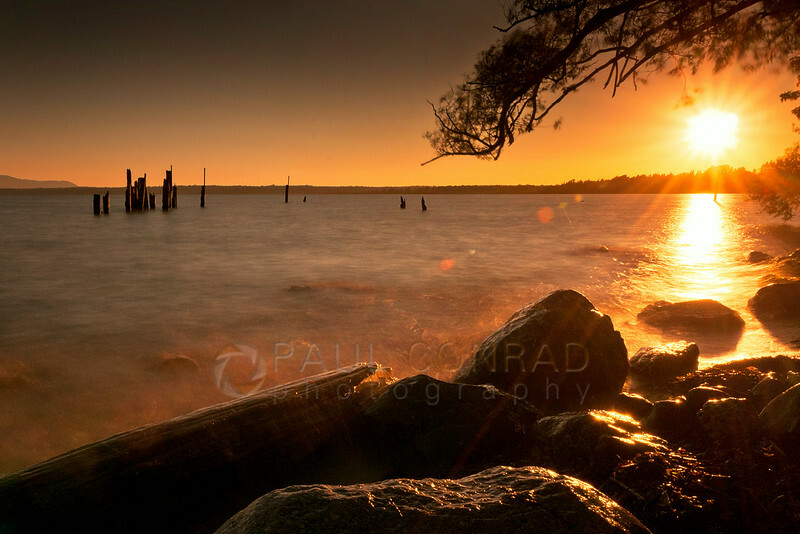 © Paul Conrad/Pablo Conrad Photography – Sunset at Locust Beach in Bellingham, Wash., on Tuesday evening July 15, 2014. This was an 8 second exposure at f/22 using my D300s with a B+W ND3.0 filter attached to my 17-35 f/2.8. I drove to Squalicum Harbor here in Bellingham to find some more as the Sun had just set. There was still plenty of light in the sky and I didn’t want to waste it. At the harbor, I saw a great composition of yellow flowers with the moored boats in the background. But I didn’t like it as there were a few gaps between the boats. So I walked around a little until I saw a similar composition with a nice line of boats in the background. The ND3.0 filter was still attached so I wanted to try some long exposures with it. My camera was set on my tripod as I wanted to try 30 second exposures. At ISO 200, the suggested exposure for 10 seconds at f/16. But I knew the reading was under as light was coming in through the viewfinder skewing the meter towards under exposure. I went to 30 seconds but still under. Then went to f/8 and it was a touch dark so I went to f/5.6 and the exposure was good. This could also be the quickly fading light as well. 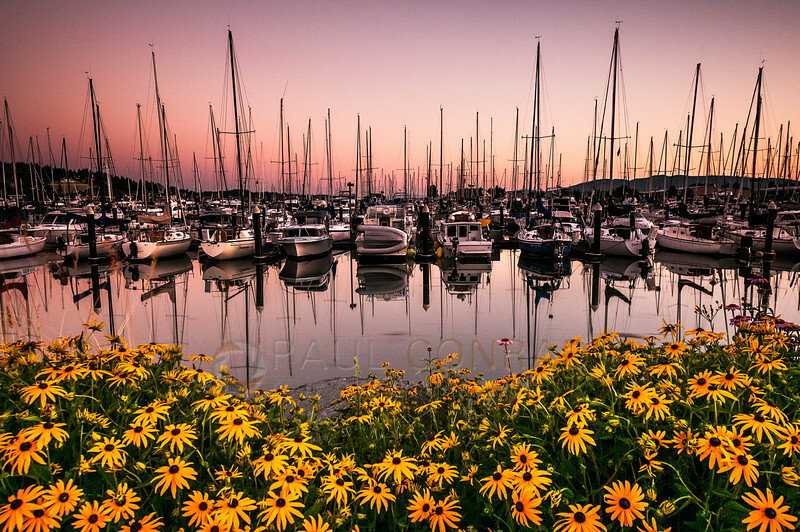 © Paul Conrad/Pablo Conrad Photography – Sunset at Squalicum Harbor in Bellingham, Wash., on Tuesday evening July 15, 2014. Nikon D300s, 17-35 f.2.8 with B+W ND3.O filter, 30 second exposure at f/5.6. The post processing was simple: imported into Photoshop Adobe Camera Raw, set white balance to daylight, increased fill light, added about 25% clarity the opened it. In PS, copied the layer, added a curves layer increasing the higher midtones while anchoring the shadow. Used the high pass filter to sharpen. It’s one of my favorite photos I’ve shot so far.